This season ends in a stormy wash. The earth’s surface rendered into a purifying mud bath, a final cleansing of body and soul as the tempest scoured landscape prepares for a new cycle. 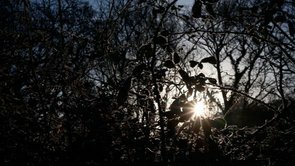 Trees have been thinned and the paths are waterlogged; allowing the piercing gaze of the sun to expose and echo each tiny transition.